On those evenings when you just don’t want to make supper, most often you’ll go to a restaurant for dinner out. But sometimes you pick up the phone, and order food delivered to your home. 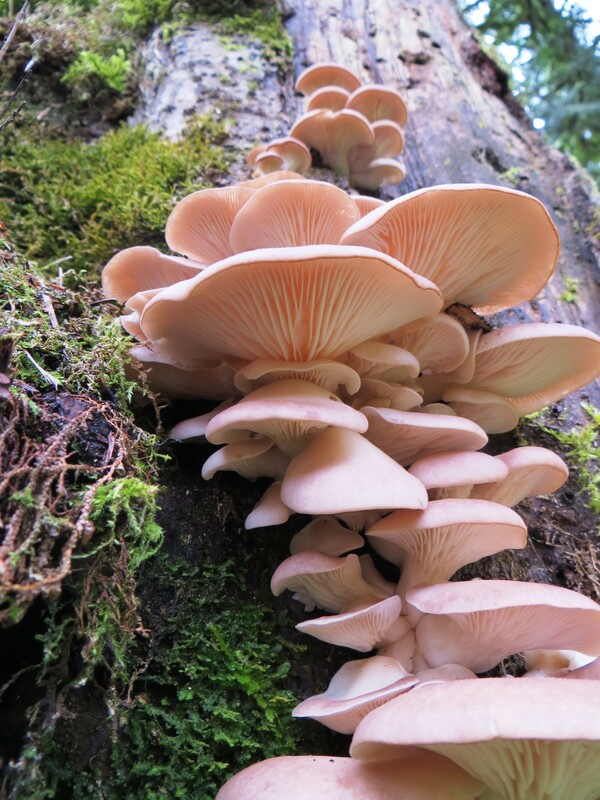 Most forest organisms use the “dinner out” option as they fly, crawl, swim or slither to their next meal. However, a few insects have learned how to get food delivered to them. These crafty critters are the gall insects. What is a gall exactly? Galls are odd-shaped lumps or blobs of abnormal plant tissue, much like a tumor in a human. Galls can form on leaves, stems, flowers, roots or buds. Galls can be caused by certain kinds of bacteria, fungi, nematodes, mites or insects. For now, let’s focus on the insects. More than 1,000 different species of insects can cause plant galls. Each of these insect species attacks a certain species of plant. In most cases, an adult gall-forming insect lays one or more eggs in soft plant tissue that is still growing. The eggs quickly hatch into larvae that stay inside the plant. Now here’s where it gets interesting. Some gall insect larvae have become tiny chemists who have the ability to produce auxin (or in some cases, auxin-like chemicals) in their salivary glands. These chemicals signal the plant to send lots of nutrients to the place where the larvae are living. This causes the plant cells around the insect to start growing very rapidly. As a result, the plant tissues produce the blob of plant tissue we call a gall. The gall provides the insect larvae with both shelter and food. The larvae don’t have to go any place for food, the food comes to them. The gall insect larvae eat a lot of the nutritious plant tissue inside the gall. 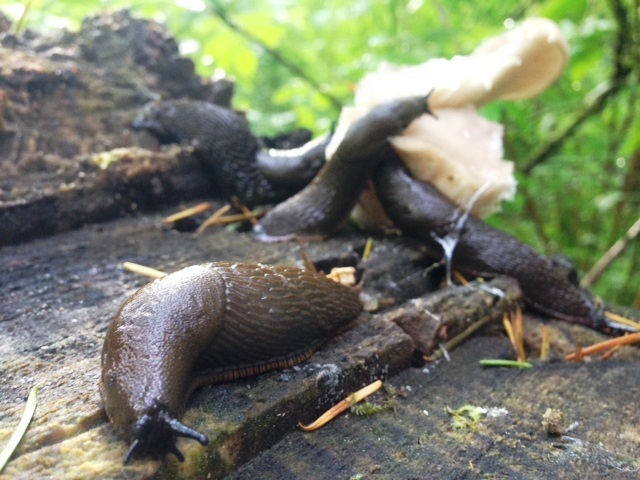 After the larvae are full size, they stop eating. In many cases the larvae use the gall as a nice safe home for the winter. In other cases, they tunnel out of the gall, and pupate on the ground. At Tryon Creek, I’ve seen three different types of galls. The first was on the stem of a thimbleberry (Rubus parviflorus) plant near Old Main Trail. 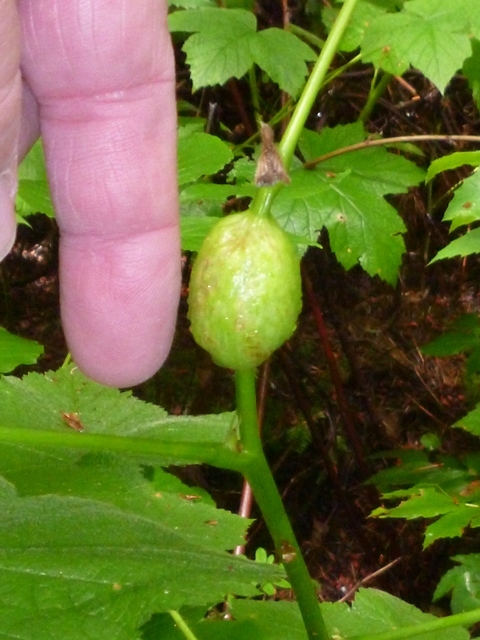 The thimbleberry forms this type of gall when it is attacked by the thimbleberry gall wasp (Diastrophus kincaidii). In this particular case, the wasp lays several eggs inside the stem, not just one. Note: The pink lump is my finger; the green lump is the gall. Another type of gall I spotted was on a twig of black cottonwood (Populus balsamifera spp. trichocarpa) tree growing near the main entrance to the park. The picture below shows a one-year-old twig. 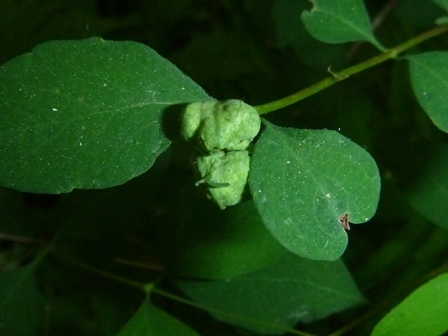 Experts at Oregon State University and the Oregon Department of Forestry said the insect that formed this gall was the Poplar twig gall fly (Hexomyza schineri). 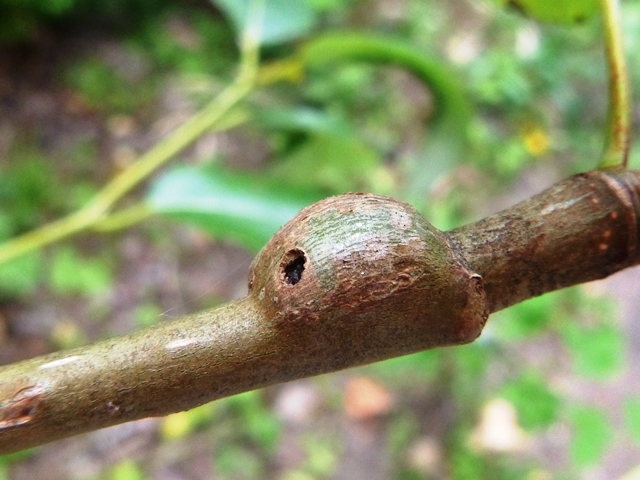 From the hole in the side of the gall, it looks like the insect has successfully overwintered inside the gall as a pupae. The adult emerged from the pupae, and bored its way out of the gall. The third type of gall is really weird. It was on the snowberry bush (Symphorocarpos albus). It is formed when a sawfly lays an egg in a young bud of the snowberry bush. 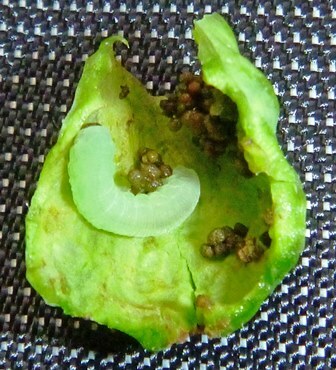 As the egg hatches, the nutritious plant tissues that make up the gall grow around the insect larva, as shown in the picture below. While having the plant deliver food to you seems like a wonderful scheme, there is a downside! Once an insect has formed a gall, the insect is not only trapped inside until it matures, but the gall is advertising the larvae’s location to the smarter predatory animals. One such animal is, well, ME! I grew up in Minnesota. In the winter my Dad and I would pick the galls we found on goldenrod (Solidago sp.) plants before we went ice fishing. Out on the frozen lake, we would cut open the galls, pluck out the juicy larva and use it for fish bait. The sunfish loved the goldenrod gall larvae. Dad and I loved the sunfish. 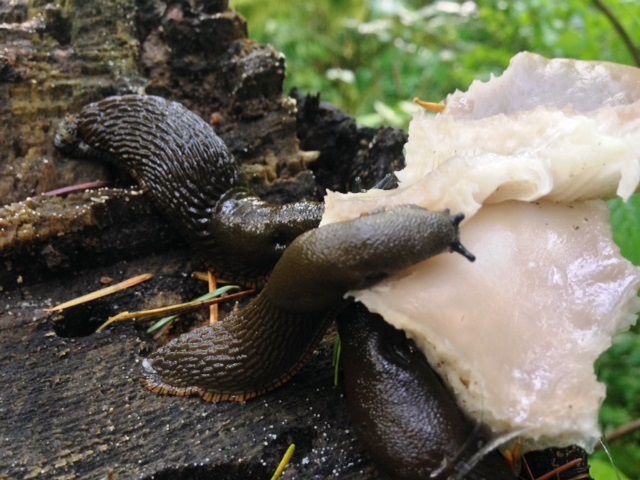 Many forest creatures have been very creative in developing unusual lifestyles to survive at Tryon Creek State Natural Area. The gall insects are just one example. 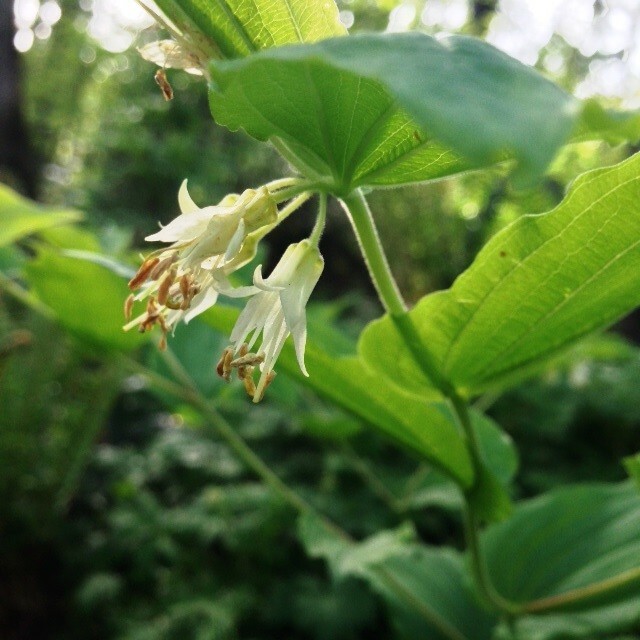 The next time you come to Tryon Creek, keep a sharp eye out, and look for insect galls on the plants. They’re just waiting for you to spot them! 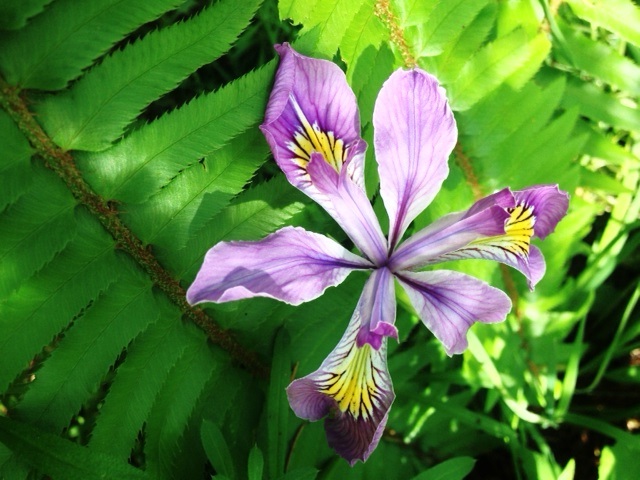 I took a moment today, stretched my legs, and wandered in the woods for a bit. The weather was so inviting, with the warm sunshine filtering down through the canopy. The maple leaves had an illuminated, transparent glow of golden quality, with a hint of green. 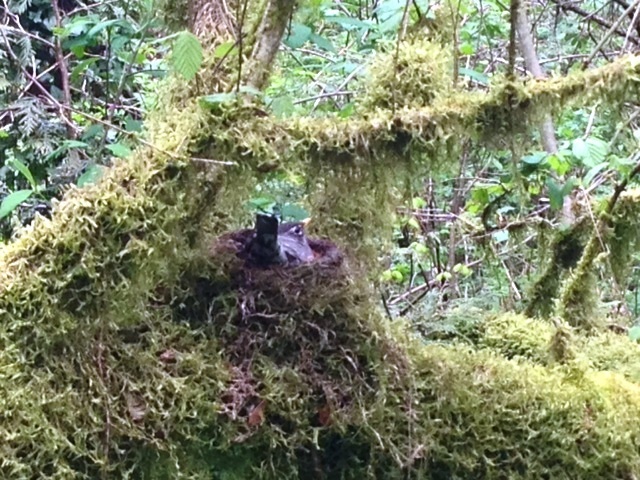 A robin was singing, hopping along the forest floor, and a raven followed, leaping from branch to branch. With a camera in hand and sketchbook in my pocket, I went exploring. 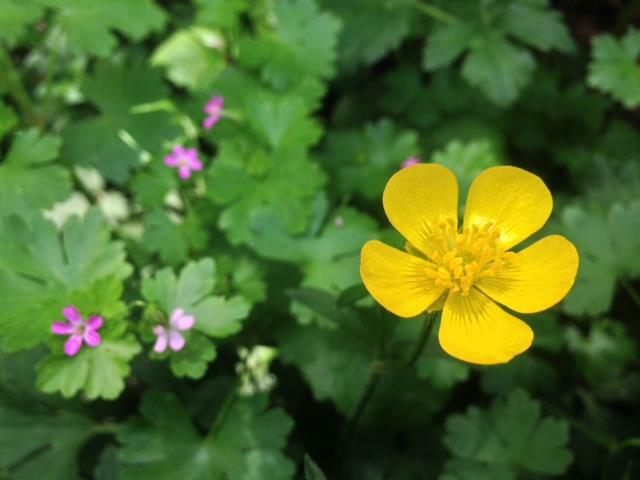 Wildflowers blooming and the littlest creatures were out feasting in the forest. I captured a few moments along the way and wanted to share. When’s the last time you wandered in the woods? Did you know a short drive from the bustling scene of downtown awaits a forest in the city for you to enjoy. 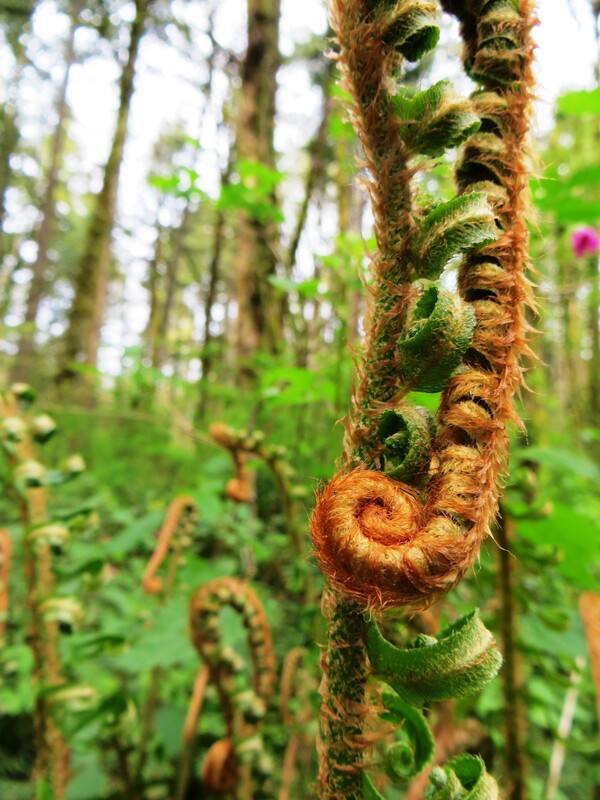 Whether you go alone for a peaceful moment of solitude or share a stroll with loved ones, there’s always something new to see, the forest invites you to enjoy, nature’s simple pleasures.